Spruce up your Christmas decorating with a beautiful Christmas tree from our cut your own fields. 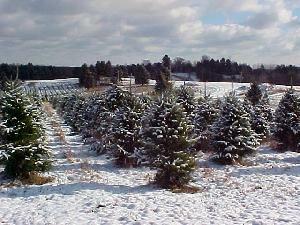 Or Choose a tree from our fresh pre cut lot. Balled & burlapped trees also available. Visit the Christmas Barn for everything you'll need to decorate your beautiful fresh tree, ornaments lights & garlands. Plus gifts, antiques & collectibles. We're not just for Christmas anymore. Help us celebrate our 34th Annual Fall Festival at Hozak Farms...starting Sept. 29th, and every Saturday and sunday in October. Plus Columbus Day, Mon, Oct. 8th. Located 10 miles west of the Pittsburgh International Airport between routes US 30 & PA 18 on south edge of Raccoon State Park.